Mayor Jenny Durkan said an outside review of the city's downtown streetcar-expansion project would be completed by last week. But that deadline has come and gone. 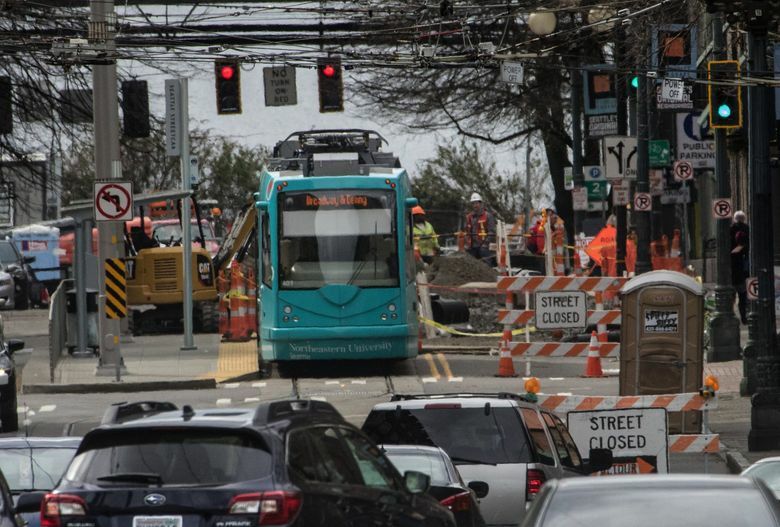 Seattle’s downtown streetcar expansion remains stuck in purgatory, with construction halted and no word on whether it will resume or if the $200 million project will be scrapped. Mayor Jenny Durkan’s self-imposed deadline for completing an outside review of the project came and went last week, but the review is not finished. At the same time, the Mayor’s Office and the city attorney have been conducting an independent investigation of the project management that led to cost increases and Durkan halting construction in March. That investigation, which City Attorney Pete Holmes said must be confidential as it progresses, is supposed to be completed by Friday. Durkan ordered an initial review of the streetcar expansion project in March, after a Seattle Times report that the Seattle Department of Transportation (SDOT) may have underestimated the costs to run the new system by as much as 50 percent. After the initial review found that estimated construction costs had risen by $23 million, Durkan halted the project, pending a thorough review and investigation. Work to replace aging utility lines beneath the streetcar route in Pioneer Square remains ongoing. There’s been no public announcement as to the status of the consultant’s review or the independent investigation since shortly after they were announced. Clay Gilge, who leads major projects for KPMG, said the consultants are refining the draft report, after receiving feedback from the city. The city’s $416,000 contract with KPMG, signed in April, says the consultant would use “best efforts” to complete its work by May 20, but carried no penalty for failing to meet that deadline. The consultant submitted a draft report June 7. Construction on the new 1.2-mile streetcar line, which would run mostly in its own lanes along First Avenue, began late last year in Pioneer Square. The new line would connect the city’s two existing streetcars, on First Hill and in South Lake Union, which have struggled with middling ridership. SDOT projected that connecting the two lines, enabling a one-seat ride across congested downtown, would cause a ridership boom. But construction costs have piled up and what was once a $150 million project had exceeded $200 million at last count. The city had essentially secured a $50 million federal grant before the pause, and was hopeful of an additional $25 million in federal money for the project. That money would almost certainly not come to the city if the project is scrapped. Last fall, as the City Council pondered granting final approval to the project, Chris Gregorich, then the city’s director of intergovernmental relations, and Leslie Pollner, a D.C. lobbyist hired by the city, warned that nixing the project would carry serious consequences. Pollner, whose lobbying firm was paid $240,000 by Seattle last year, briefed the City Council on Monday. She didn’t mention the streetcar, but warned of “an increasingly politicized process” for handing out federal transportation money.